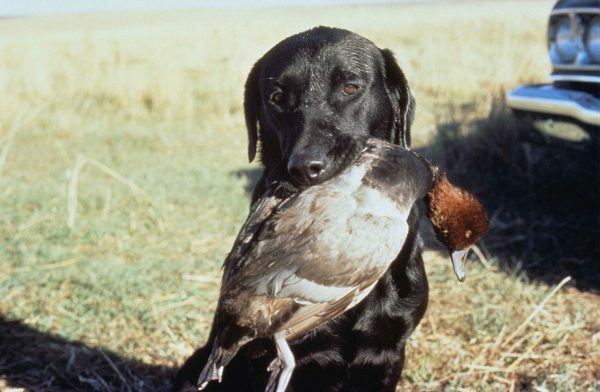 Hunters are picky about their favorite breeds of hunting dogs. Each breed has its own strengths and weaknesses, yet there are specific breeds that standout as the best for each type of hunting. Ranking the best dogs is not an easy task, but here are the top breeds for the most popular forms of hunting. The hands down favorite when it comes to duck hunting is the labrador retriever. The lab was bred specifically for the duties that are needed in duck hunting. They mark the target, go get it and bring it back. In addition, labs are very smart, have boundless energy and are not adverse to cold temperatures and frigid water. They also learn quickly and are excellent at obeying in the field. The crown for the best pheasant hunting dog goes to the English springer spaniel. This breed is hard-working and high energy, which are traits that are essential in pheasant hunting. Yet, its strongest attributes when it comes to pursuing pheasants are its flushing and retrieving skills. Springer spaniels can dramatically improve your pheasant hunting success, because they are renowned for their ability to locate birds and then drive them out. The beagle might not be number one on many hunters’ list of best hunting dogs, but if you are hunting rabbits, this is the breed you want at your side. Beagles are extremely focused and do not give up. They are exceptionally talented when it comes to locating rabbits and driving the animals toward you. They are also smart and have high stamina for a long day in the field. The head of the pack when it comes to grouse hunting is the English setter. The amazing nose on this breed is second to none when it comes to locating grouse. Its pointing ability is especially suited to grouse hunting, because they locate the birds, but do not spook them, giving hunters plenty of time to prepare for a shot. English setters are not afraid of cold weather and have a high amount of energy. The feist is not a household name when it comes to hunting dogs, but it is the best when it comes to squirrel hunting. The feist is tenacious in its pursuit of squirrels. They are exceptionally good at silently locating squirrels. Then when they have chased the animal into a tree, they bark alerting the hunter to its location. When it comes to locating large game, the best all-around dog is the coonhound. Tough and focused, the coonhound can track down a wide variety of large game, ranging from bears to cougars. The coonhound has amazing stamina and an incredible sense of smell, which is its strongest asset. Determined and focused, the Chesapeake Bay retriever shares many of the same qualities that make the Labrador retriever the top pick for duck hunting. Yet the Chessie is better suited to hunting ducks in the sea, because of its oily coat and ability to battle tough water conditions.